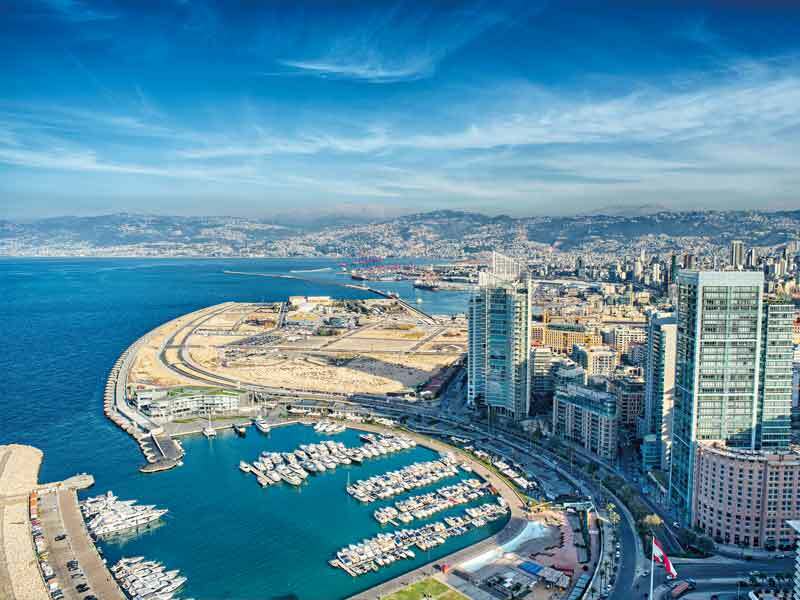 Large, well-developed and proficiently regulated, the Lebanese banking sector has been driving growth in a country challenged by regional uncertainties. The country’s resilient banking sector played an instrumental role in securing economic growth over the past few years. The sector was pivotal in weathering external shocks and sustaining Lebanon’s economic stability during the latest political stalemate, which came to an end when the Lebanese parliament finally elected a president in the last quarter of 2016. The election of a president, the appointment of a new prime minister, the formation of a new cabinet and the passage of a new electoral law brought in positive development to Lebanon’s political and economic outlook. The country was presented with an opportunity to move beyond its two-and-half-year political impasse. In addition, despite regional tensions and the conflict in Syria, security conditions in Lebanon have been well maintained. Economic activity recorded a one percent growth rate in 2015/16, and is expected to improve to two percent in 2017. Despite the fact that the country’s debt-to-GDP ratio reached 148 percent, it remains below the peak of 185 percent reached at the end 2006. In order to boost fiscal sustainability, policies that promote inclusive growth and adequate allocation of government spending to public services and infrastructure are necessary. As noted, Lebanon’s resilience hinges on the continued health of its macrofinancial structure. Banks in Lebanon operate under the jurisdiction of the Central Bank of Lebanon, Banque du Liban (BDL), and the Banking Control Commission. Through its sound governance, stringent rules and regulations, and proactive strategies, BDL has shielded the Lebanese banking sector from major financial crises and set forth a solid foundation for prudential banking activity in the country. In May 2016, BDL administered a financial operation in an attempt to bolster its foreign exchange reserves and strengthen the overall financial position of the country. As a basic step, BDL swapped Lebanese pound government debt for new eurobonds with the Ministry of Finance. In June 2016, BDL encouraged domestic banks to purchase the newly acquired eurobonds and FX-denominated long-term certificate of deposits. In turn, local banks were offered sizable incentives to take part in the operation and were able to attract foreign currency deposits from outside the country. This enabled banks to recognise an 8.5 percent increase in deposits between June 2016 and June 2017, reaching $167.7bn by the end of June 2017. Lebanese banks also witnessed growth in their total assets, which increased by 9.3 percent between June 2016 and June 2017 to reach $208.2bn. Lebanese commercial banks therefore remain the chief source of funding to the economy. Moreover, this unconventional financial engineering has strengthened BDL’s gross foreign reserves to reach $53.8bn (including gold reserves) by the end of July 2017. 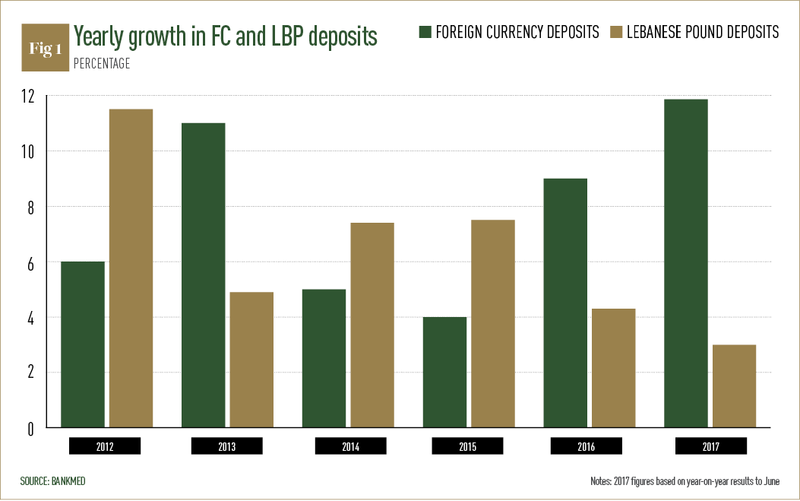 BDL’s credibility and sound monetary policy, geared at targeting Lebanon’s pegged exchange rate, preserves confidence in the system and supports domestic demand through the accumulation of gross reserves (excluding gold), which reached $42.15bn by the end of July 2017, increasing by 14.7 percent from July 2016. In addition to the rigorous regulatory framework, the Lebanese banking sector draws its strength from its high liquidity and capital adequacy, which allow the sector to absorb shocks. Banks in Lebanon remain highly liquid, achieving a loans-to-deposits ratio of 31.4 percent as of June 2017. Similarly, high capitalisation also serves as a buffer in mitigating risks within adverse economic conditions. Lebanese banks have exceeded the requirements of Basel III with a ratio of 16.6 percent recorded in 2016, surpassing the global standard as well as the minimum requirement set by BDL. Hence, banks in Lebanon remain well capitalised, another aspect that underpins the resilience of the Lebanese banking sector. With assets of more than 350 percent of GDP, total sovereign exposure makes up 60 percent of aggregate banking sector assets, where banks hold more than half of Lebanon’s treasury bills and eurobonds. In turn, banks are primarily funded by core deposits. An estimated 84.6 percent of total deposits are in account balances greater than $100,000, while 50.2 percent are in accounts with balances greater than $1m, and 3.7 percent are in account balances greater than $100m. Aggregate private sector deposits in the banking sector have been expanding over the past five years, reaching $167.7bn in June 2017, up by 8.5 percent annually from June 2016. Of this figure, 80 percent are resident deposits and 20 percent are non-resident deposits. Moreover, much of this growth is attributed to an increase in foreign currency deposits, which reached $111.8bn in June 2017, rising by 11.7 percent from June 2016 (see Fig 1). This draws on Lebanon’s healthy macrofinancial structure, which rests on the banking sector’s ability to attract continued inflows and maintain its fixed exchange-rate. With respect to Bankmed, the bank has sustained its performance in the first half of 2017. The bank’s total assets saw an annual increase of 2.7 percent, reaching $16.3bn at the end of June 2017, while loans stood at $4.9bn. As for net profit, it grew by 2.9 percent to reach $79.4m in the first half of 2017. On the liabilities front, customer deposits witnessed a yearly increase of 3.7 percent to reach $12.3bn at the end of June 2017, and loans-to-deposits ratio stood at 40.7 percent. With regard to the provisions coverage ratio, including collaterals on non-performing loans, it was 111.3 percent, indicating Bankmed’s rigorous strategy in safeguarding its assets. In terms of liquidity and capitalisation, the bank’s foreign currency liquidity ratio stood at 33.3 percent, surpassing the 10 percent regulatory requirement, while its capital adequacy ratio reached 14.6 percent, also exceeding the requirement set by BDL. As such, high liquidity and strong capitalisation remain among the fundamentals that Bankmed’s management continually focuses on. Bankmed has sustained its growth, capitalising on a prudent strategy, a balanced approach to risk and sound corporate governance. The bank’s diversified business model, along with the synergy between its local and regional entities, has always served to underpin its growth and operations. Locally, Bankmed has been expanding its geographic coverage, adding new branches to its network in an aim to access new markets and extend its various distribution channels. Bankmed’s ongoing investment in technology through supporting small companies that are geared towards banking technology and solutions defines its domestic advancement and diversifies its investment opportunities. Investment banking and the securities trading execution business play a pivotal role in Bankmed’s operations. In 2017, the bank revamped this business line in order to consolidate all investment, hedging and trading activities in one place to better serve its clients and have comprehensive coverage for all asset classes. Its professional relationship managers will handle all client activity, enabling customers to benefit from fully fledged services in Beirut and equally access BankMed Suisse products and services. A new unit will be set up to cater for non-resident, high-net-worth and institutional clients. Also, a desk dedicated to sourcing and placing corporate advisory transactions will be expanded. Moving forward, a desk will be established for a mergers and acquisitions advisory team. On regional and international levels, the bank enjoys a strong presence in the Dubai International Financial Centre, Saudi Arabia, Turkey and Iraq, as well as Cyprus and Switzerland. While all of Bankmed’s regional entities have been contributing to its sustained growth, the bank’s private banking arm, BankMed Suisse, which has been operating in Geneva for more than 30 years, remains one of the bank’s main business lines. Capitalising on the expertise of its advisory team, its open structure, and its profound knowledge of both the Middle East and its own clients’ needs, BankMed Suisse offers private banking and wealth management services to high-net-worth individuals, mainly from the Middle East and the Gulf Cooperation Council region. It also provides credit facilities and commercial services for some of its clients. It is worth noting that Bankmed recently completed the licensing process to establish a subsidiary of its GroupMed reinsurance brokers in the UK in line with its expansionary strategy. The future carries great promises for the Lebanese banking sector. Having a government that is able to tackle the country’s pending reform agenda has a material impact on confidence and growth by boosting inflows, supporting financial stability and helping Lebanon’s debt dynamics. This could pave the way for enhancing macroeconomic stability and establishing a sound operational environment. All in all, improvements in political and economic conditions locally and regionally are expected to have a positive effect on the overall economy in Lebanon. Such encouraging developments would attract larger domestic and foreign investment, create job opportunities and place Lebanon on a sustainable growth path. In turn, Bankmed will continue to capitalise on promising opportunities locally and regionally in line with its expansion strategy.